With its broader muscular stance, distinctive body cladding, and an electrically folding swing top canvas roof, the new Opel Adam Rocks is a bit of a mould breaker. It is set to roll into Ireland next month, priced from €18,995. Key to its purposeful stance is a 15mm increase in body ride height, giving greater ground clearance, and a wide, robust, appearance. Numerous components have been modified or re-tuned to provide limitless driving fun. These include dampers, springs, the front and rear suspension geometry, steering, and the electronic stability control programme. 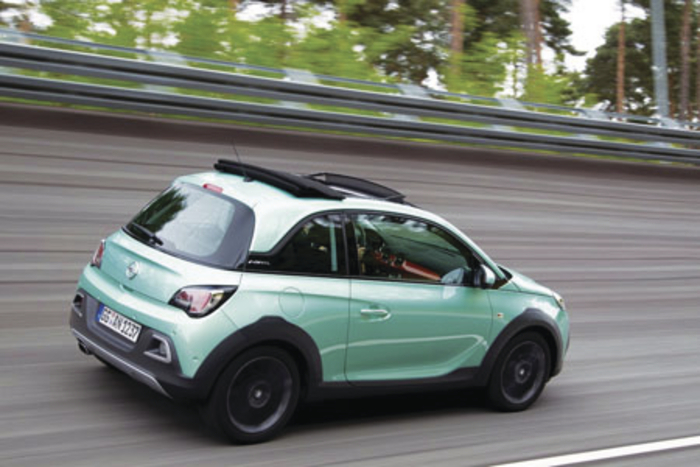 To prove the effectiveness of all these changes, Opel engineers have once again put the Adam Rocks through its paces at the Opel Test Centre in Dudenhofen, Germany. The car was put through its paces around a mixture of terrains and circuits and covered approximately 40,000km. They tell us that this assessment is equivalent to covering 160,000km on particularly demanding real roads. Opel says that vehicles at its test centre are exposed to levels of stress and strain in just 24 weeks that correspond to an entire vehicle life experience under normal road conditions. For example the Rocks was put through a durability test on what Opel claims to be the auto industry’s first urban three-door mini-crossover track that has more than 900 metres of potholes. During the development phase of Adam Rocks, everything for the prototype making in the development centre is carried out by hand. In contrast, speed and volume count in series production. That is why the team brings the Adam Rocks into the workshop after the various test runs and examines the vehicle and its individual components. “We want to be absolutely sure that our series production cars drive exactly like we tuned our prototypes during development. In the process, safety, quality, and endurance are top priority for us,” a spokesman told us. So when the endurance test is completed, engineers again check all the fastening elements which were bolted together by series equipment, disassembling the Rocks down to its single components to assess every single part.